5 (Information taken from "Records of Robert Fuller of Salem and Rehoboth and Some of his Descendants" by Clarence C. Fuller, Oxboro, Mass., and "A Record of Some of the Descendants of Rubert Fuller of Salem and Rehoboth," by James Fuller Spoerri. In 1638, Robert Fuller came from Southampton, England, aboard the ship Bevis, and settled in Salem, Mass. According to land deeds, he bought or held land rights in Reheboth in 1645, but remained in Salem. He was a bricklayer for several years, but not the only one as indicated in some genealogy histories of Robert Fuller. On June 28, 1653, he signed a treaty to settle differences of the town of Rehoboth with Capt. Myles Standish, and Thomas Willett and Josias Winslow, as found in the Bristol County, Mass., Plymouth County Deeds, v. 2, part 1, page 79. In "Early Rehoboth, v 3 by Richard Bowen: In 1676, Robert's wife, Sarah and two sons, John and Samuel ("Robert Fuller of Salem ..." by Jean Muir, Dorsey, Urbana, Ill.), and son-in-law Nehemiah Sabin, were killed during an Indian attack on the town. His home and most of those in the town were destroyed in a raid during King Philips' War. After the tragedy, Robert gave much of his property to his sons and grandchildren, and held some jointly with son Jonathan. In 1677, he returned to Salem, and was admitted as Selectman of Salen. Shortly after, he moved back to Rehoboth, where his sons Benjamin and Jonathan lived. Robert divided his estate among his children before he died. No settlement of the estate has been found. He is buried three miles from Seekonk, per Rehoboth Town Records. Census 1: 1658, Took Freeman's oath. Census 2: 1653, Signed treaty to settle differences for Rehoboth with Capt. Miles Standish. Census 3: 1673, Paid taxes for King Philip's War. Fact 1: Brick layer in Salem; only one in New England?. Fact 5: 1678, Married Margaret Felton Waller. Fact 6: 1679, Admitted to First Church of Salem; assigned seat directly behind ministers. Fact 7: Fuller Cemetery is in Seekonk, a part of Rehoboth. Military service 1: 1638, Sailed to New England aboart Bevis Ship. Military service 2: Settled in Salem, MA. Occupation 1: bought land in Rheoboth, MA, but remained in Salem. Occupation 2: 14 October 1676, Wife Sarah Bowen, 2 sons, son-in-law die in Indian attack on town. Occupation 3: 1677, Returned to Salem, admitted by Selectmen as Inhabitant. Marriage: Abt. 1640, Salem?, Mass. #97 - John Brown to Mrs. Margaret Robson, Dec 23, 1829. Abr. Knight, J.P.
12 1900 Census of Woodbury, Sioux City, Iowa shows a Jude Brown, born April 1845 In Pennsylvania, whose parents were born in Pennsylvania and New York. His wife Mildred of 5 years, and daughters Flora and Cora, aged 3 and 9/12. Johan Jacob "Wagonmaker" (Braun) Brown, born 1731 in Ruschberg, Rheinland-Pfalz, Germany, was the oldest son of Johan Stephen Christian Braun (1702-1762) and Maria Eva Hamen. 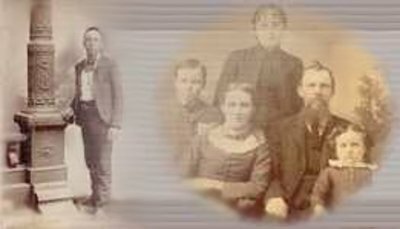 His paternal grandparents were Johan Hans Jacob, blacksmith and farrier, and his wife Verena Agnes Braun; his maternal grandparents, Michael Hamen, court bailiff and his wife Anna Catherina Schneider Hamen. Jacob, along with his parents and younger siblings, arrived 9 September 1738 in Philadelphia, Pennsylvania on the ship, GLASGOW. The family settled in Lancaster County, Pennsylvania and resided there until the 1750's, when they moved southward to Rowan County, North Carolina. After arriving in Rowan County, the family began spelling their name "BROWN". In 1760 and 1761, Jacob purchased two tracts of land on Crane Creek, Rowan County, from the Earl of Granville. A portion of this land adjoined that of Jacob's brother, Michael Brown (1732-1807). Jacob was a wagonmaker, and performed patriotic service during the American Revolution by making and repairing wagons. In 1796, Jacob moved from Rowan County, North Carolina to Washington County, Tennessee. Three of his sons, George, Jacob, Jr., and Abraham, had settled in Washington County several years earlier. Jacob purchased 235 acres of land on a branch of Little Limestone Creek from John Rimeal 17 July 1796. Later that year, he sold portions of this farm to his sons, Jacob, Jr. and David. As years passed the small stream that flows from east to west through the farm became known as the Brown Branch. This farm remained in the Brown family for nearly 150 years, with the last Brown owner selling out in the 1940's; it is presently owned by John W. Howze of Telford. Mr. John W. Hawze, passed away in 2009, I do not know who owns the property now. An old log cabin that was located on this farm was believed to have been Jacob's home; in January 1987, the cabin was dismantled by two descendants, James C. and James T.Dykes, and stored for future restoration. After moving to Washington County, Jacob began to be referred to as "wagonmaker" in deeds and other legal documents in order to distinguish him from another, unrelated Jacob Brown, who lived near the Nolichucky River. Several of Jacob Brown's children attended Cherokee Baptist Church, a short distance south of the Brown farm; however, it is not known whether Jacob attended services there. Many of Jacob's children, grandchildren and other descendants were blacksmiths, wagonmakers, and wheelwrights. James T. Robeson, guardian of Harriet and Jacob Robeson, orphans of Frederick Robeson. May 27, 1833. $100. Surety, Caleb Pendarvis. John Brown, guardian of Stephen Robeson, orphan of Frederick Robeson, May 27, 1833. $130. Surety, Joseph Pendarvis. 50 Came to America in the "Ann" in 1623, aged about 13. See "Plymouth Colony, It's History and People 1620-1691". On March 6, 1665/6 the court allowed Giles Rickard, Jr. ten shillings from Abraham Jackson concerning a controversy between them over a parcel of tar.